Last month, Dean, and I were lucky enough to go on a rather amazing vacation. 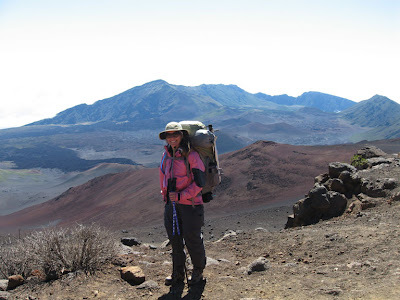 A multi-day hike across the vast Haleakala Crater on the island of Maui. It was a lot of work, lugging 40 lb. packs across uneven broken lava fields and slippery volcanic gritty ash, but it was so surreal to see this extinct volcano up close and personal. 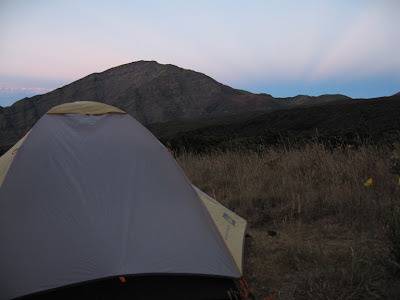 Here is how we spent a wonderful few days in the Heart Of Haleakala. 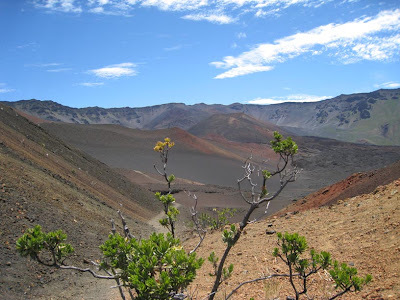 Haleakala, known as “The House Of The Sun” is a dormant shield volcano on the Island of Maui. We drove up the crater on a long and winding road, through the beautiful countryside of Kula, filled with cattle, horses, and lush green rolling hills. Eventually, we arrived at the lower visitors center. The landscape turned a bit more barren and many times as we drove higher and higher, we were so deep in the clouds that it was very slow going, as we couldn't see 10 feet in front of us! There are no gas stations, no places to eat, nothing but a twisting, turning road, and beautiful views of west Maui (when the clouds cooperate and clear up for a while). After a 10 mile drive from the lower Visitor Center, we arrived at the summit visitor center, which is about 10,000 ft. above sea level. 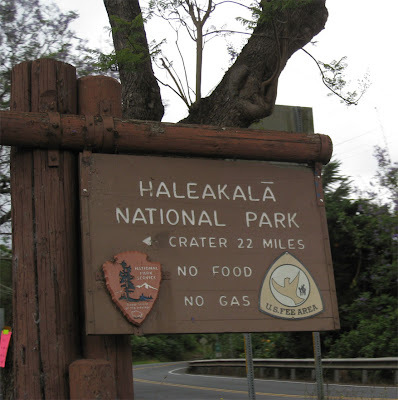 Here is where we started our great adventure into Haleakala Crater. This is the "Sliding Sands" Trailhead. "Paliku", 9.8 miles away, is our destination for today. 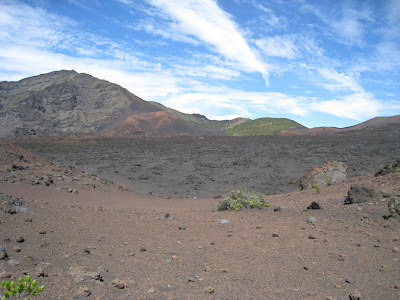 At the top of Sliding Sands, you get an awesome view of the crater. To the left is the Koolau Gap. The clouds love to roll up through here, but on a clear day, you are able to see down to Hana, and the ocean (so I am told, the clouds never did clear for us). 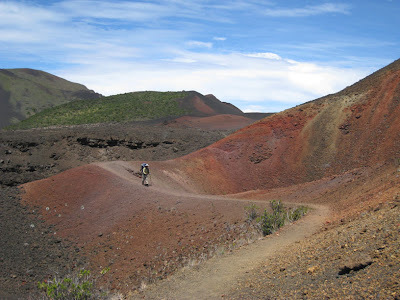 The Sliding Sands Trail takes you down a few thousand feet to the crater floor. Paliku is the furthest ridge near the right hand side of this picture. You really get a feel of the vast magnitude of this wonderful place, so much more than just viewing it from the overlook of the Visitors Center. What looks like it would take only an hour or two to hike across, literally takes all day. Scale is very deceiving here. 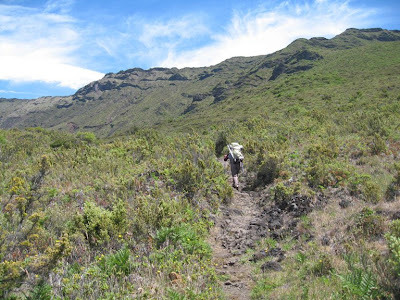 The trail is a somewhat steep downhill, not too treacherous, but you do have to watch your footing - they don't call it the Sliding Sands Trail for nothing! 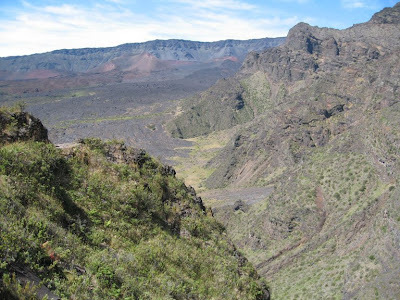 The views down the crater are something almost otherworldly. 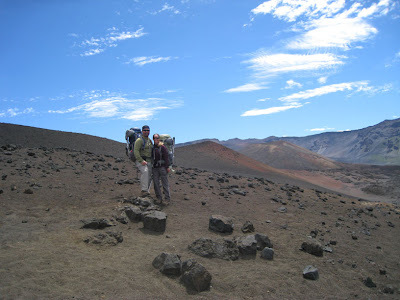 Once you get along the trail a ways, most of the tourists have turned back and you have Haleakala all to yourself. 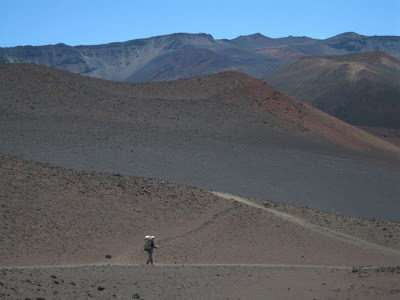 It is so quiet and peaceful, all you hear is the CRUNCH CRUNCH CRUNCH of your boots on the dry crumbled lava path. Here is Dean about half way down the Sliding Sands Trail. I could not walk close behind, as the dust clouds that rise from walking on this ash makes quite a bit of mess that is not enjoyable to hike through. 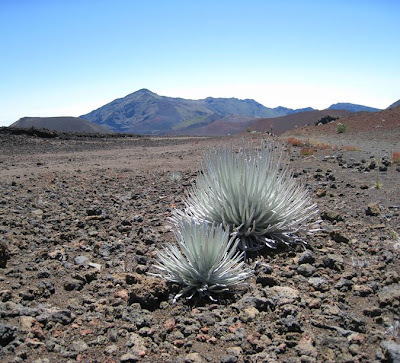 This is the "Haleakala Silversword", also known as "Ahinahina". 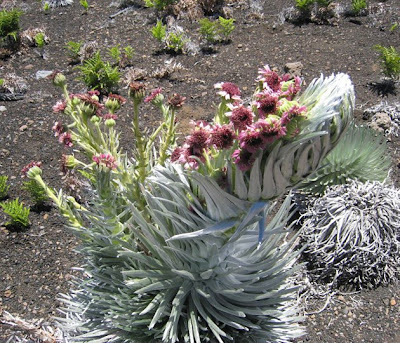 This plant is found only on the slopes of Haleakala, on Maui. They say that Ahinahina can live up to 50 years. They bloom once in their lifetime, and then die. Here is a silversword in the process of blooming. Unfortunately, I didn't get a very clear picture of it. I thought there would be much better opportunities for photographing Ahinahina on a later day, when we were to hike through the "Silversword Loop" on the opposite end of the crater. Unfortunately, for me, this was the only silversword we saw in bloom the entire trip. Around 1:30 p.m., we were still about two miles from Paliku. 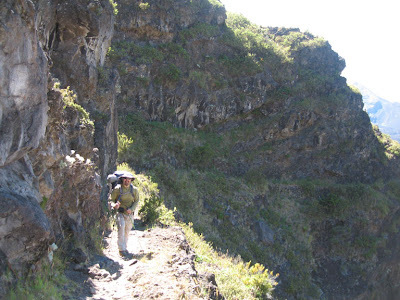 Here, the trail got much rougher and the hiking was slower. 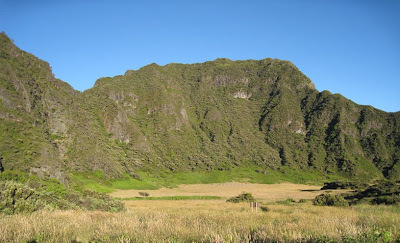 The clouds you see here are coming up the opposite side crater gap, known as the Kaupo Gap. It was amazing to see these clouds come in so quickly, but they would always dissipate when they got into the crater a ways. They looked like large dragons making their way across the lava fields. Finally, after a little less than 7 hours of hiking, the gorgeous green mountains of Paliku (which means "vertical cliff") can be seen! So different in contrast to the barren red cinder landscape we had been traveling through just a few hours ago. 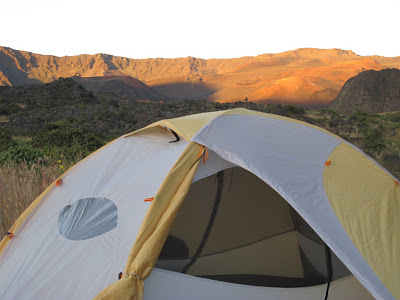 I can't think of a more beautiful setting for sleeping out under the stars in the Haleakala Crater!! 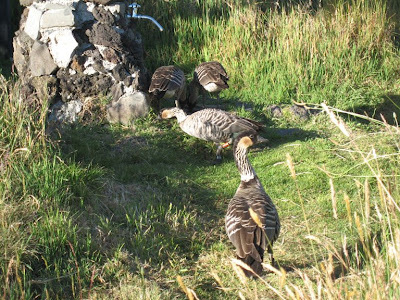 In the evening, we were visited by several of the Hawaii State Bird, The Nene Goose. They flew in from all around, and gathered in the large grassy area. They were our only companions at Paliku. Here they are hanging around the "water cooler" catching up on all the latest gossip, no doubt. 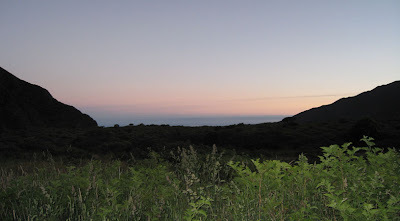 The view from our tent: Sunset at Paliku, looking through the Kaupo Gap. The solitude is overwhelming (even your cell phones don’t work! ), but it is a peacefulness like you can’t imagine. 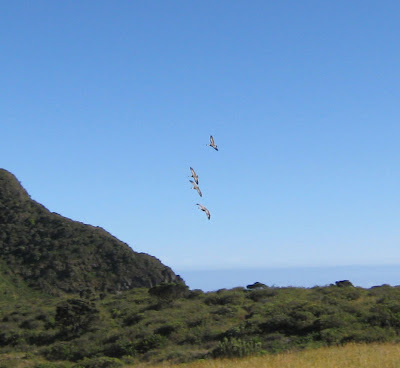 You are completely alone, yet you feel entirely safe and comfortable, surrounded by the walls of Haleakala. It really is a very special place! The next morning we woke up from a wonderful night's sleep. We made delicious blueberry pancakes and sausage, and just enjoyed the day. We wanted to take in Paliku, and not rush off to the next destination. Midday became very hot, and we were beginning to wonder if we shouldn't have headed out, but after exploring the area, we found a beautiful shaded grassy area and spent the afternoon playing cards, listening to the unusual birds - tons of them - in the trees up on the cliffs, and being entertained by the Nene that would casually walk across the field eyeing us somewhat suspiciously. It was a great day! Early the next morning, we were packed up and heading out to our next campsite, Holua. 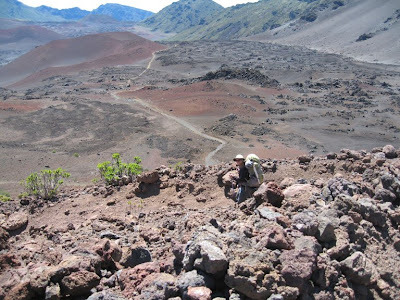 It is approximately 6.6 miles from Paliku, across the other side of the crater. As we passed the Kaupo Gap this morning, the clouds had cleared a bit, and you could see Mauna Loa and Mauna Kea on the Big Island, popping out above the clouds. 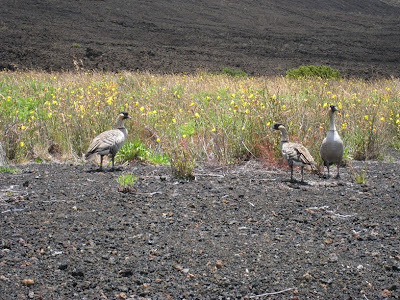 Then, about 2 hours into our hike, we ran into more Nene just out in the middle of a barren lava field. I am so amazed that they have adapted themselves to live in these (what seem to us, anyways) harsh conditions. Just some of the unusual beautiful scenery along the hike. This area is known as "Pele's Paint Pots". 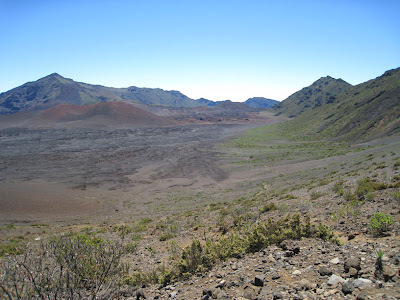 It is said that when Pele painted the beautiful landscape of Haleakala, here is where she dumped the leftovers. It looks believable! The craters here are a brilliant display of reds, oranges, yellows, and even sparkly golden flecks that shimmer in the sunlight. Of course, pictures cannot capture what we saw in real life, and this was one of our favorite parts of the trail. Here, we are about half way to Holua. 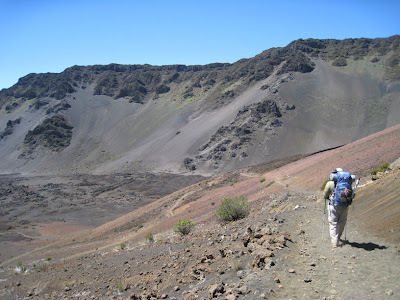 In the background, you can just barely see the Sliding Sands trail, making its zig-zaggy way down the side of the crater. Hard to believe that was the trail we came down two days ago. Amazing scenery everywhere you look!!! We are in the belly of a volcano!! We had perfect beautiful weather our entire trip. 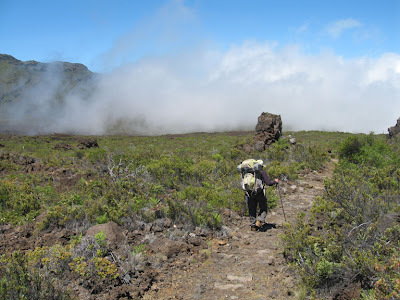 Never once did we get socked in by the well known Haleakala clouds that can unpredictably roll in on a moments notice. They may not actually bring rain, but they do hold a damp misty moisture that is so thick, it can soak you to the bone in a matter of minutes. 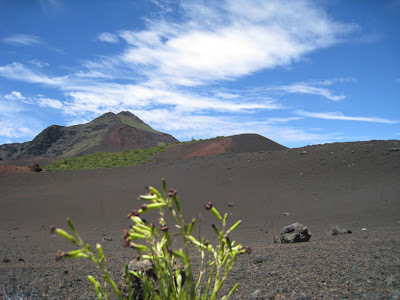 Towards the afternoon, we had to cross another barren lava field. This was another favorite section of the trail. It was so peaceful and so surreal. 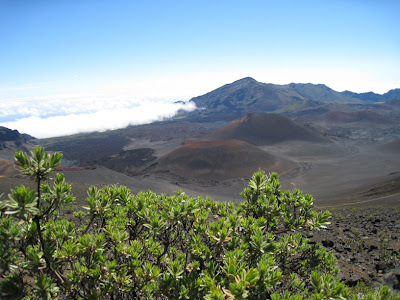 With 360 degree views of all of Haleakala. 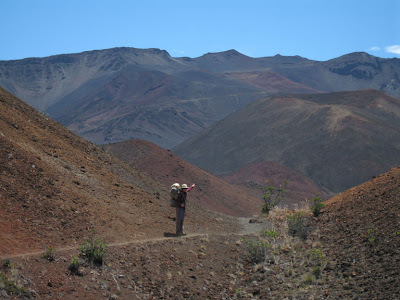 Every cinder cone, every crater wall. Except, now you are at the bottom, looking up, rather than looking down into the crater from the summit. We finally made it to Holua around 3:30 p.m. It was not as lush as Paliku, but it was still a pretty neat place, and afforded a different perspective of the crater. We set up the tent and had a wonderful Quesadilla dinner. We watched the sun disappear behind us, slowly darkening the walls of the crater. 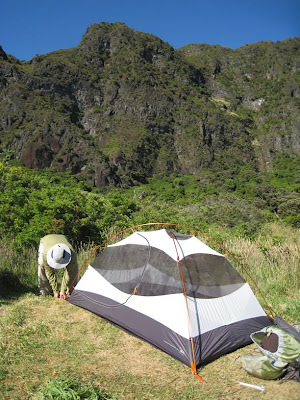 The next morning, bright and early, the sun peeped up through the Koolau Gap making a glowing spectacle of the crater walls behind us. 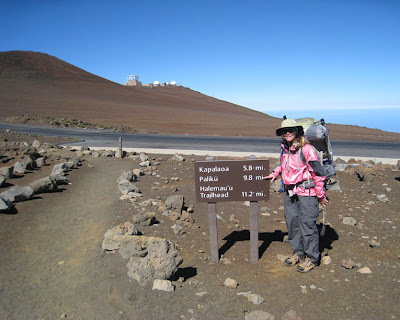 Today would be our last day, hiking up and out of the crater, to the Halemau'u Trailhead. It is only about 4 miles, but it is uphill switchbacks most of the way. Here, you can see, etched in zig-zags across the mountain, the many switchbacks we will have to cross to reach Halemau'u. The trail was quite narrow, and a bit spooky, especially as you climb higher and higher, but it seemed to be very well maintained. A view of the Koolau Gap from about half way up the switchback section. And the switchbacks keep going and going and going..... Around each corner, you pray that this is the last one. Then it is over. We finally made it up and out of Haleakala Crater. It is a bittersweet feeling. 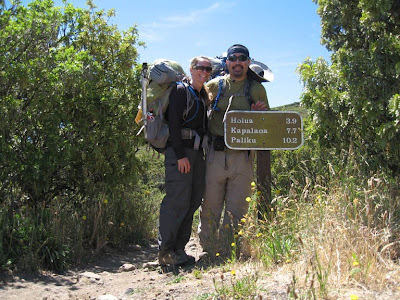 You are so relieved to be back to "civilization" and looking forward to the simplest things like a real shower, unlimited drinking water, and good hot Mexican Food! How we CRAVED that! 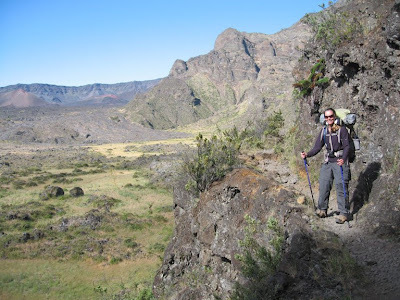 But thinking back on this adventure, you forget the brutal hours trudging across dusty rough lava, and all the work it took to get fresh water, set up camp, and cook a (somewhat) decent meal. You only remember the beauty, the solitude, the peacefulness of this wonderful place, and are so thankful that you got to experience it in a way that not many people get to. 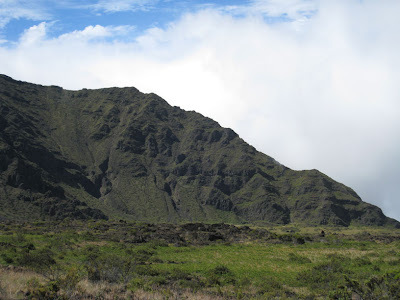 I hope we get a chance to return to the "Heart Of Haleakala" again some day! 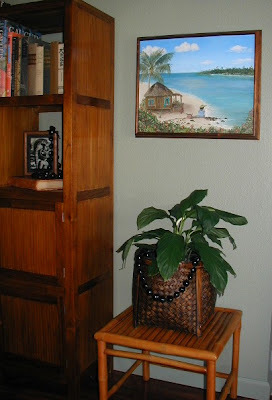 I finally got around to finishing up two of my "Island Dream Life" paintings. The first is "Talk Story"
and the second is "Tutu's Secret Fishing Spot". 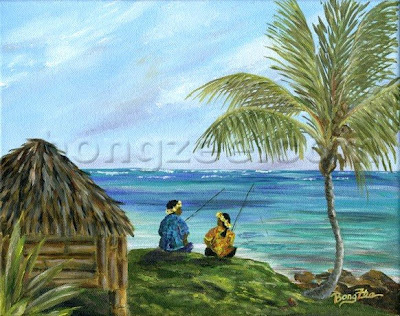 I love to paint "Island Daily Life" scenes. The characteristics of the Polynesians just seem to appear as I go. I do not really plan out how they will look, I just start painting, and a unique personality evolves right before my eyes! They are really my favorite to paint. 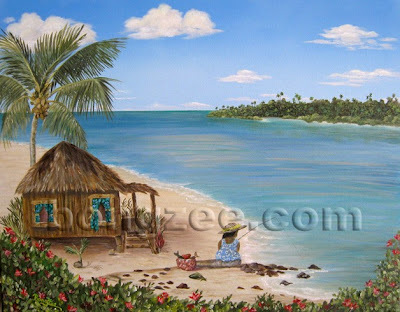 And dreaming of the simple laid-back lifestyle of the South Pacific is something I never tire of. 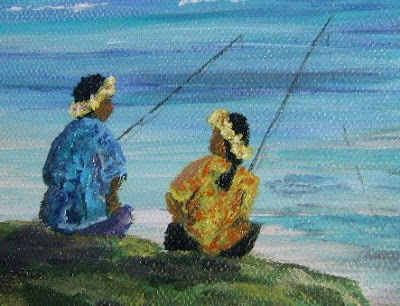 "Talk Story" is a fun relaxed typical Polynesian fishermen scene. Two locals spend the afternoon waiting for a bite on the line, but even mo' important, they "talk story". A peaceful setting among the tropical landscape. 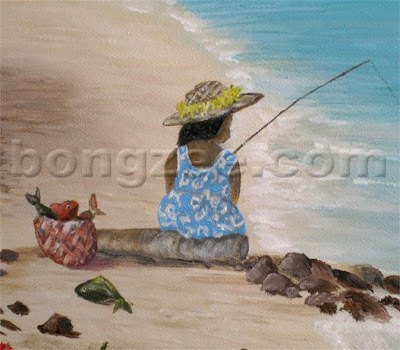 "Tutu's Secret Fishing Spot" was painted off and on over a course of about 10 months. I had to be in just the right mood to work on it, and I was so happy with how it turned out, it has ended up being one of my all time favorites. (Click on the photo for a larger image.) I have framed it in solid koa, and plan on holding onto her for a while! My Poppop and Grandma just celebrated their 70th Wedding Anniversary. 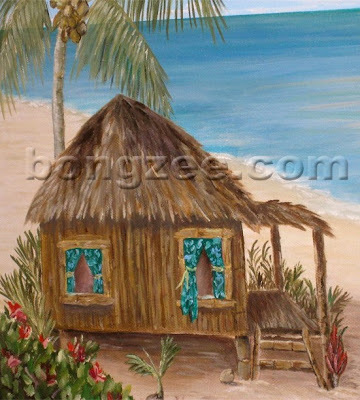 They live in Shalimar, Florida, so I wanted to paint them a special little mini beach scene. The beaches of the Florida panhandle are quite a bit different from Hawaiian beaches, but every bit as beautiful. 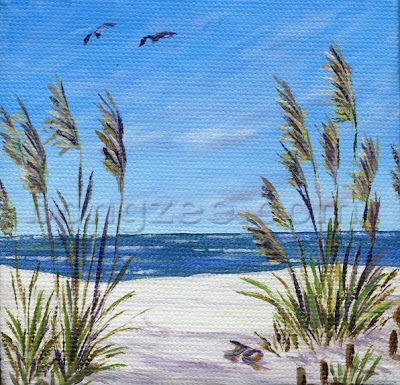 There are long flowing sea oats that wave about in the offshore breeze, "white as snow" sand dunes (as opposed to our tan colored coarse crushed coral sand here in the Islands), and the water is a different shade of blue green. I had a bit of trouble at first trying to keep my Hawaii influence out of the scene, but eventually, it started to resemble the beautiful beaches that line the Destin area. 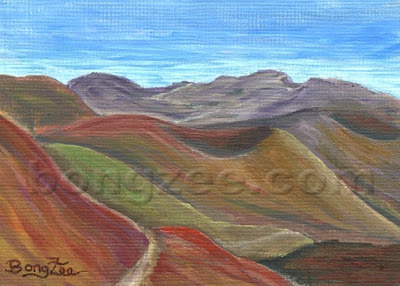 This painting was done on a 4" x 4" mini canvas with the sides painted, as well. I added in a small section of practically buried "sand dune" fence, which is typically seen along these coastlines (used as a measure to try and help preserve the disappearing dunes), a pair of happy sea gulls - which believe it or not, we don't really have here in Hawaii, and a subtle "70" shadow on the sand to personalize the painting just for them. I can only hope that one day I will be so lucky as to be celebrating my 70th Wedding Anniversary with the man that I love. My Grandparents are very special to me, and I wish they didn't live so far away. HAPPY ANNIVERSARY POPPOP AND GRANDMA! The Japanese White-eye, also known as Mejiro, is native to Japan. It was introduced to Oahu in 1929. It's a common small bird here in Hawaii, found in the city as well as forest areas. It usually travels in small flocks. 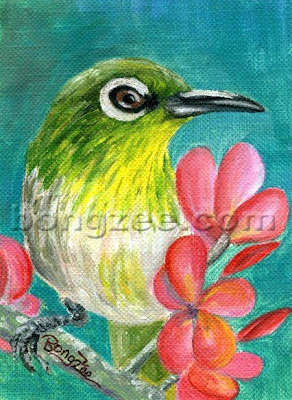 It is a cute little song bird that slightly resembles the native Hawaiian bird, Amakihi. The difference between the two however, is that the Mejiro has a white circle around the eye, while the Amakihi does not. These little song birds are plentiful in my yard but I have to be extremely patient (or lucky) to catch a glimpse of them. They are quick moving, always on the search for nectar, insects and fruit. They bring a colorful little addition to my garden, and I am happy to have them around. I have become so fascinated with the little birds that keep me company as I paint outdoors that I thought it would be fun to try and paint a few of their portraits. 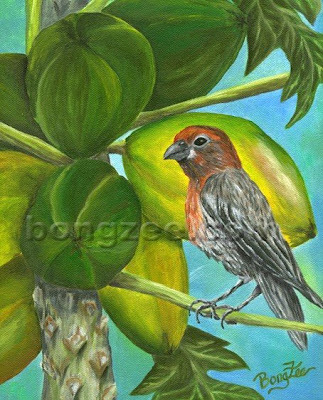 Papaya Birds, also known as House Finches, are abundant around our yard, and yes, they DO love papaya! They will peck a perfect round hole right in the center of the fruit, just as it is ripening, eat their fill, and leave the rest. I have to be quick to pick the fruit before they get to them, but occasionally they will beat me to it, (which is ok by me). As long as their sweet little chatty chirps keep me amuzed all day, I don't mind sharing my Papaya with them!